The year 2012 was a very eventful year in chess with the Olympiad in Istanbul and two World Championships (open and women) taking place. There were also records falling with Magnus Carlsen breaking the ELO record of Garry Kasparov. While the record became official in 2013, the Norwegian broke the record at the London Chess Classic in December 2012. Carlsen wasn’t the only player to have a banner year. Fabiano Caruana ended the year at a career-high of #5 on the ELO list with a rating of 2782! He came in joint first with Carlsen at the Sao Paulo/Bilbao Masters only to lose to Carlsen on tiebreaks. 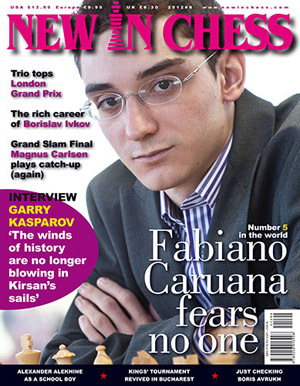 The cover story reads, “Fabiano Caruana fears no one” and perhaps the photo on the inside may show us what is to come in the future… Carlsen and Caruana on the same stage. The issue gives a couple of epic battles between the two including the mammoth struggle in round six. Caruana will get another crack at Carlsen in the upcoming Tata Steel tournament. Kasparov is featured in a very interesting interview about his current activities, stance on FIDE, turning 50 and his fears. The interview is very detailed, compelling and provides the reader with an update and overview of Kasparov’s mindset these days. In the end, the one thing he fears… to become irrelevant. He also gives some wisdom from his mother… “life must have a purpose”. Well-said. If you’ve been reading the issues of New in Chess since the redesigning, you will probably take more appreciation in not only the layout, but the photography. There is a stunning photo on page 37 with Hikaru Nakamura and Anish Giri engaging in post-mortem at the FIDE Grand Prix in London. (see right) It was mentioned somewhere that the event lost $600,000, but it was a beautiful failure! London is quickly becoming a force again in organizing top-level events. Topalov won the tournament without a loss. A couple of articles appear to look into the minds of two famous players. There is an intriguing story about Alexander Alekhine as a schoolboy and an intriguing interview with Vassily Ivanchuk who is often photographed with strange expressions. He states rather blithely, “I am completely normal.” His recently snubbing of the ceremonies at the Olympiad in Istanbul had many scratching their heads. In this interview, he addresses this issue beautifully and we learn quite a bit about this enigmatic persona. Excellent!